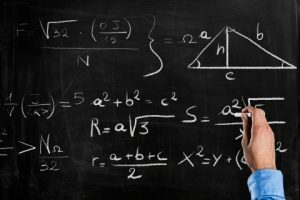 Geometry brings the abstract thought involved with algebra into the physical world, which is why students who generally struggle in algebra prefer geometry’s straightforward visualizations and concepts. Because geometry is generally easier for students to understand, we start working proofs, logic, and mathematical reasoning into this course, setting the groundwork for students to think critically about arguments presented to them. In addition, there are several ways to look at geometrical features and concepts, making this course full of different approaches to the same problem.